After watching the UGPG webinar last night, I realized I'm not on my game this year. Being in a new home there is a lot of things going on in getting not only the pumpkin patch setup but all of the landscaping. Its a lot of work just to plan, more or less actually do. Matt McConkie shared a lot of good ideas and one of the things he talked about was the number of days the plant will grow. The weigh-off is September 23rd this year which is pretty early. That means we season is a week shorter. Normally I'll get my seeds started around the 15th, but that would leave me with a pretty short growing season. Instead I'm going to start my seeds on the 6th, which should be enough time to get close to full growth on the pumpkin. The problem that creates is planting the pumpkin outdoors. Last frost in Midway, Utah isn't until the first week of June. That means a number of cold nights and slow growth. What I think I'm going to do is try to keep the plants indoors as long as I can. I'll need bigger pots to make that work, but if I'm going to get the number of growing days that I need it is the only way I can maximize the early season growth. Hopefully that will work out and it will be a warm spring. From past experience, I've found that early season growth isn't completely important. 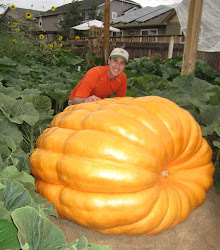 I've seen in my own experience cold, wet springs with almost no sun (in May two years ago I think the sun came out three times the entire month) and even though growth is stunted early, when it finally warms up the plants can catch up fairly quickly and you can still have giant pumpkins as long as the summer weather is good.